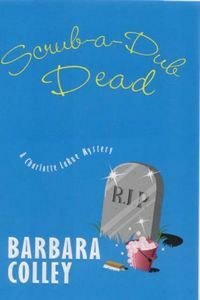 Scrub-a-Dub Dead by Barbara Colley, a Mysterious Review. Review: Scrub-a-Dub Dead, by Barbara Colley, is the sixth mystery in this series featuring Charlotte LaRue, owner and manager her own New Orleans maid service for the genteel folk of the Garden District. Charlotte is looking forward to some well earned time off. Instead, she agrees to help out a friend who has a contract cleaning rooms at the Jazzy Hotel and is currently a bit-handed. While working at the hotel, she encounters the members of the Red Scarf Society, a group of socially prominent women from Shreveport who are visiting New Orleans. When a young woman, who just happens to be the dating the estranged husband of one of the society members, is found strangled with a red scarf, Charlotte finds herself drawn into a complex web of secrets and lies that just may involve a special person from Charlotte's own distant past. This well written and constructed mystery has at its core a strong character in the form of Charlotte LaRue. Charlotte is reminiscent of one's favorite aunt, someone who's weathered more than her fair share of life's personal storms, yet maintains a positive outlook and whose advice, when given, is meaningful and sound. Colley frequently allows the reader to follow Charlotte's reasoning in analyzing the crimes, sorting out what's possible and impossible, plausible and implausible. For a story that has a fairly complex set of relationships, this approach helps clarify (both for Charlotte and the reader) who may be innocent and who most probably is not. Many mysteries would be greatly improved if their authors followed Colley's lead in this regard. What is disappointing in the book is the general lack of depth and originality in the supporting characters, most of whom are completely unmemorable. It's likely that twenty minutes after finishing the last chapter, one would be hard pressed to name any of the victims or even the perpetrator of the crimes. Potential readers who assume, not unreasonably, from the title that this is some light, frothy cozy will be sadly disappointed. Scrub-a-Dub Dead is definitely a cut above the average book in this genre. Acknowledgment: Breakthrough Promotions provided an ARC of Scrub-a-Dub Dead for this review.